One of the most fun things to do in Chennai, the Click Art Museum has got to be on your list while exploring this city. 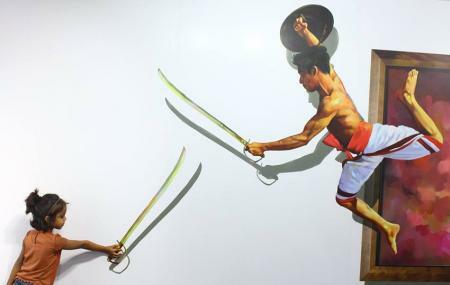 A one of its kind “Trick Art” museum in India, this attraction holds a brilliant display of twenty interactive displays, that are as good as real. These displays are an enthralling sight given the way they stimulate your senses. The museum runs by the quote “Pleasure of being deceived”. And the best part, unlike other museums you can click as many picture as you would like, here. How popular is Click Art Museum? People normally club together Tiger Cave and Vgp Golden Beach while planning their visit to Click Art Museum. Fun place to click pictures. Entry fees 100rs for click art museum and 100rs for celebrity statues. If you go only for click art museum or celebrity statues, cost varies. Visit to both the places and have a good time. Good place to visit. Both art and wax like musume is 200 rs. Worth for the price you can spend max one hour in this place. It's nice place to explore with friends and taking different pictures but there is no air-conditioning so we are all get tired within 5min because of sweating...price is slightly high..